My youngest 'Sprout' recently had a presentation on the country of Ecuador for her Geography class.Part of the project involved bringing in a food or regional dish from that country. Then we remembered tamales! Of course! A little bit unique, interesting, (relatively) easy to make and transport, and possessing that "fun" factor my daughter was hoping for. Now, I've had tamales many times, but never seen them made in miniature, probably because they're JUST as much work and labor intensive as full meal-sized ones, maybe more-so. Once we figured out the scale of how small to make and fill them, everyone pitched in and we had a steamer full of 50 tiny tamales in no time. Yes, I DID say above that these were "easy" and I still feel they are. I don't always think 'quick' = 'easy', though. They are time-consuming, so may not exactly fall into everyone's definition of "easy". 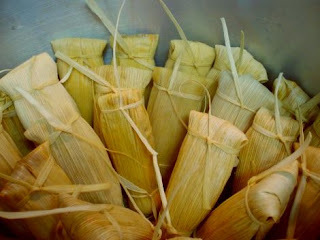 Just so you know, tamales originated in early Mesoamerica. 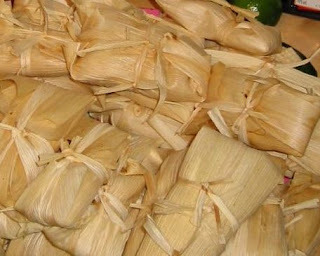 Aztec and Mayan civilizations as well as the Olmeca and Tolteca before them used tamales as a portable food, often to support their armies but also for hunters and travelers. Corn masa and meat, bean and/or cheese; wrapped, and then steamed. Known as humitas in Ecuador, corn husks or canna leaves are used. Traditional fillings include boiled eggs, spices, chicken, carrots, bananas, green olives, raisins and nuts. Since I don't have a ready source for canna leaves (they're a large lily that grows only in the tropics) we went with corn husks, much like the traditional Mexican tamale. We minced our ingredients very fine, since we were making such small tamales. If I were making bigger/traditional sized ones, I would probably chop things a little coarser. 2 cups (or more) Tamale Masa (Looks like this, you can buy in most standard grocery stores, in the Mexican food section). Combine masa, baking powder, salt and seasonings in a bowl. Work the broth in with your fingers until it forms a soft dough. Add margarine and coconut oil and beat with mixer until dough is fluffy. Add more masa or broth if needed. The dough should be like very soft, fluffy mashed potatoes. 1 cup shredded vegan cheese of your choice (you'll need it to melt - we used Teese from the lovely Chicago Soy Dairy folks - use whatever you like). 16 - 20 corn husks, soaked in water while you make the dough and filling. Put "burger" of your choice in non-stick skillet. Add oil and warm a bit, you might need to add more oil (sorry!) depending on the product. Add onion, bell pepper and garlic, saute on medium until onion is translucent and peppers are soft, making sure not to burn the garlic. Add green olives, garbanzos, peanut butter, tomato sauce and hot sauce. Continue to stir together and heat over low, until peanut butter and hot sauce are incorporated. Add allspice, raisins and salt to taste. Continue heating over med-low, stirring frequently until all ingredients are hot. Remove from heat. Add cheese and stir in until melted. The filling should be sticky, not runny. Now fill and roll your tamales. At this point, you're on your own. I was taught how to roll tamales years ago by an elderly Hispanic woman who spoke little English - I'm still not sure if I'm doing it "right", but it seems to work. I think everyone should learn that way. To write out the method would take another two or three blog posts. Instead, PLEASE go this TAMALE ROLLING TUTORIAL and watch the very helpful video. MUCH easier than trying to read instructions! Or simply Google "How To Roll Tamales" and you'll get all sorts of different (and equally authentic) ideas! We rolled our "mini" tamales much smaller, but you get the idea. After an hour, unwrap one and test; the filling should be firm and fall away from the cornhusk in one piece, if it's still sticky, continue to steam. Add water to the steamer as needed. When finished, let them cool a bit and serve with your favorite sauce. You can also freeze them and reheat later, or serve cold in your lunchbox! I love making tamales! This is a whole different kind of filling and I can't wait to try it. I am going to New Mexico in May (crosses fingers it doesn't fall through) and I am hoping to bring home some very, very inexpensive New Mexico munchies to use in my cooking..